Bright green wavy foliage and extra large white flowers and a central maroon blotch. 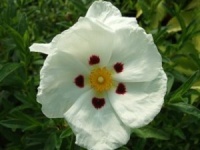 A medium sized erect hybrid Cistus, it has a beautiful downy covering to the leaves and stems. The flowers are a lovely pale pink. Less commonly found than many cistus but equally beautifull, Cistus Jesters forms a low spreading shrub ideal for hot dry spots. In early summer the mid green foliage is hidden by the delicate rose pink flowers with a yellow centre. Sun Rose" As the name suggests, this is a sun loving shrub. Plant in full sun to best enjoy the candy-floss pink flowers in late spring and summer. Max height 3 ft / 90 cm. Water regularly until established. 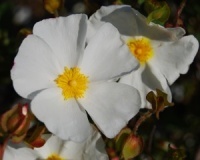 Cistus Decumbens makes a lovely low and spreading form of this easy to grow 'rock rose' with comparitively large white flower s occassionally with a red blotch to the base. One of the hardiest hybrid Sun Roses, with lovely crimson flower buds, opening pure white. An excellent choice for a sunny spot.